There is no reason to buy fajita seasoning mix in a packet when you can make some of your own in your kitchen. It tastes delicious! You can mix up a batch of it an just use it whenever you want. 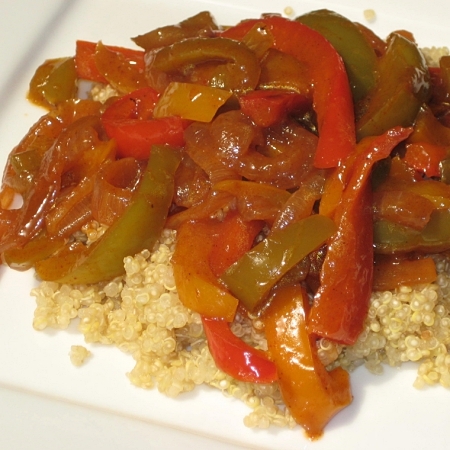 In the photo below, I just sautéed a bunch of peppers and onions, added the seasoning mix, and served it over quinoa. No need for any meat! You can spice up all sorts of veggies this way. Mix it all up in a baggie or airtight container. To season meat and/or veggies, add 2/3 of a cup of water + 3 Tbsp. of seasoning mix (per pound of meat). This makes 10 tablespoons of seasoning, and each serving is 3/4 Tbsp. The peppers and onions were so colorful while they were cooking, and smelled delicious! And after adding the seasoning, I could have eaten them plain, they were so good. You can double or triple the recipe to always have some on hand. Enjoy!